BACKGROUND AND PURPOSE: Three-dimensional time-of-flight MR angiography (3D TOF MRA) often discloses prominent posterior cerebral artery (PCA) laterality in the setting of M1-segment middle cerebral artery (MCA) occlusion. We sought to analyze the implications of prominent PCA laterality at 3D TOF MRA. METHODS: We retrospectively reviewed 3D TOF MRA and digital subtraction angiography (DSA) findings in 25 patients (12 male, 13 female; mean age, 68.8 years [age range, 29–94 years]) with M1-segment occlusion. The observable laterality of the PCA, determined on the basis of 3D TOF MRA findings, was scored according to distal signal extent and compared with findings of collateral flow from the ipsilateral PCA via the leptomeningeal anastomosis (LMA) at DSA. Frequency of PCA laterality at 3D TOF MRA in patients and that in 56 healthy control subjects was also compared. RESULTS: The positive predictive value of PCA laterality for the existence of collateral flow was 99.9% and the negative predictive value 30.7%. The distal extent of ipsilateral PCA signal at 3D TOF MRA positively correlated with the grade of collateral flow from the PCA via the LMA (r = 0.802; P < .01). PCA laterality was significantly less common in control subjects (P < .01). CONCLUSION: Prominent PCA laterality at 3D TOF MRA in patients with M1-segment occlusion represents the existence of collateral flow from the PCA via the LMA. Prominent laterality of the posterior cerebral artery (PCA) has often been encountered in patients with M1-segment middle cerebral artery (MCA) occlusion at axial three-dimensional time-of-flight MR angiography (3D TOF MRA). Mishkin and Schreiber (1) stated that, in patients with MCA occlusion, the primary collateral pathway is via the leptomeningeal anastomosis (LMA) from the PCA and anterior cerebral artery (ACA). Thus, this finding suggests that collateral flow from the PCA to the ipsilateral, occluded MCA is achieved via the LMA; however, to the best of our knowledge, no study has explored the relationship between the anastomosis and prominent PCA laterality. In patients with M1-segment occlusion, it is important to identify collateral flow to predict the final site of infarct. The purpose of this study was to evaluate the implications of prominent PCA laterality by comparing 3D TOF MRA and digital subtraction angiography (DSA) findings in 25 patients and 56 control subjects. Twenty-five patients (12 male, 13 female; mean age, 68.8 years [age range, 29–94 years]) with MCA occlusion who underwent both 3D TOF MRA and DSA between January 1999 and March 2002 were included in this study. The interval between performance of DSA and MRA ranged from 0 to 65 days (mean, 4.3 days). Three patients underwent DSA before MRA. The occluded site was the M1 segment, which was confirmed at DSA, in all cases. Sixteen patients underwent MRA within 24 hours after onset of neurologic symptoms. Time elapsed between MRA and symptom onset was between 24 hours and 2 weeks in five patients and exceeded 3 weeks in four patients. MRA was also performed in 56 healthy control subjects (33 male, 23 female; age range, 36–74 years [mean age, 57.0 years]) who completed a preventive screening physical examination program at Kameda Medical Center and reported no history of steno-occlusive disease in the intracranial vasculature. Control subjects comprised 28 individuals with bilateral, normal-type PCAs and 28 individuals with unilateral, fetal-type PCAs. MRA was performed with a 1.5-T whole-body MR unit (Magnetom VISION; Siemens, Erlangen, Germany) with a circular, polarized head coil. MRA images were obtained by using a single slab perpendicular to the basilar artery and centered on the circle of Willis. The slab thickness was 70 mm. The three-dimensional fast imaging with steady-state procession sequence was used with the following parameters: TR/TE, 32/6.9; flip angle, 15°; and signal acquired, one. Magnetization transfer contrast, tilted optimized nonsaturated excitation, and zero-fill interpolation were also used. DSA was performed with a conventional radio-angiography system (KXO 2000 DF, Toshiba, Tokyo, Japan) by using the Seldinger method via the transfemoral approach. Catheterization of the bilateral internal carotid and vertebral arteries was performed with a 5F selective catheter. DSA was used as the criterion standard for diagnosis of M1-segment occlusion and assessment of collateral flow. Analysis was done by using anteroposterior or lateral or both stereoscopic views. The definition of collateral flow via the LMA was retrograde filling of contrast material in MCA branches that were more caudal than angular. To quantify collateral flow via the LMA from each PCA to the ipsilateral MCA territory, we scored the number of visible cortical branches of ipsilateral MCA (A) and maximum retrograde filling of contrast material (B) during capillary-phase DSA (Table 1). 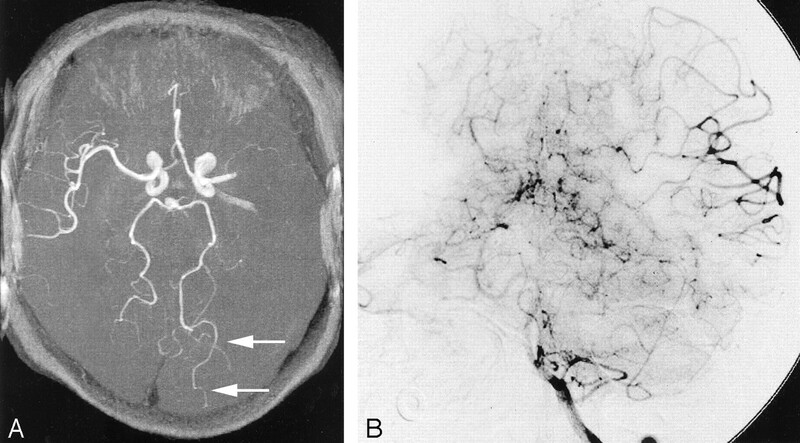 In cases of fetal-type PCA, branches with retrograde filling below the angular artery were defined as PCA collaterals. The number of the visualized cortical MCA branches was scored on the following scale: 3 signified more than five visible branches; 2, three or four visible branches; 1, one or two visible branches; 0, no visible branch. Maximum extent of retrograde contrast material filling was scored on the following scale: 3 signified extent to the M2 segment; 2, to the M3 segment; 1, to the M4 segment; 0, no retrograde filling. The summed scores (A + B) were considered as a true representation of the degree of collateral flow and classified into three grades (prominent, mild, and absent) depending on the total scores. Prominent collateral flow was defined as the total score of more than 4, mild collateral flow as the total scores of 2 or 3, and absent as the total score of 0 or 1. Collateral flow from the PCA was analyzed by using lateral and anteroposterior stereoscopic views. All images were viewed by two radiologists (A.U., T.O. ), who were blinded to patient diagnoses and each other’s reading before consensus findings were reached. The observable laterality of bilateral PCAs at MRA was defined as the distal signal extent viewed on axial stereoscopic images. To evaluate signal extent, we used Zeal and Rhoton’s classification of each PCA segment (2). We considered P2a (anterior ambient segment) and P2p (posterior ambient segment) as different segments and identified calcarine and parieto-occipital arteries distal from the anterior limit of the calcarine fissure as the P4 segment. The observable laterality of the PCA compared with that of the contralateral side was scored on the following scale: 2 signified that the ipsilateral PCA of the occluded MCA was two distal segments; 1, the ipsilateral side was one distal segment; 0, no laterality was noted; −1, the contralateral side was more distal than the ipsilateral side (Table 2). If the distal signal was over almost half of each segment, the signal was defined as “observable.” When the signal of the bilateral PCAs ended in the same segment, laterality was defined as negative. In the control group, we evaluated whether the observable laterality of bilateral PCAs was simply positive or negative. We calculated the positive and negative predictive values of PCA laterality for the existence of collateral flow at MRA. The Spearman rank-order correlation test was applied to assess the relationship between degree of PCA laterality at MRA and degree of collateral flow via the LMA. The χ2 test was applied to assess the differences in PCA laterality at MRA between patients and control subjects. To evaluate the influence of PCA origin in control subjects, we compared the frequency of PCA laterality at MRA between those with the bilateral, normal-type PCAs and those with the unilateral, fetal-type PCAs by using the χ2 test. A retrospective analysis of 25 pairs of PCAs (patient group) was performed. DSA showed no collateral flow from the ipsilateral PCA in four cases, mild collateral flow in 10 cases, and prominent collateral flow in 11 cases. Correlation between degree of collateral flow and signal laterality is shown in Table 3. MRA did not reveal any case in which a more distal contralateral PCA was visualized. No laterality was noted in 12 cases. Ipsilaterally, one-segment distal laterality was noted in 11 cases: an ipsilateral PCA extended to P4 in eight cases, to P3 in two cases, and to P2p in one case. Two-segment laterality was noted in only one case. The positive predictive value of PCA laterality for the existence of collateral flow at MRA was 99.9%, and the negative predictive value was 30.7%. Spearman’s rank-order correlation showed that the scores of observable laterality of bilateral PCAs at MRA strongly correlated with degree of collateral flow via the LMA from the PCA to the ipsilateral MCA territory (Spearman’s r = 0.802; P < .01). Increased collateral flow correlated with more distal signal extent in the ipsilateral PCA. In nine cases in which the P4 segment was observable only on the ipsilateral side, prominent collateral flow from the PCA via the LMA existed. The ipsilateral, fetal-type PCA was noted in five cases of MCA occlusion. Among five patients with ipsilateral fetal-type PCA, two patients had prominent collateral flow and three patients had mild collateral flow. In two cases, PCA laterality was not found at MRA. A statistically significant difference (P < .01) in PCA laterality was noted between patients and control subjects (Table 4). Among 56 control subjects, PCA laterality was noted only in four subjects: one from the bilateral, normal-type PCA group and three from the unilateral, fetal-type PCA group. No significant difference in PCA laterality was noted between the two control groups (Table 5). LMAs between cerebral arteries are extensive in the pia over the cerebrum. They are arterial from end to end and vary in diameter from 200 μ to 600 μ. These anastomoses represent the major collateral system distal to the circle of Willis, and collateral flow via the LMA begins almost immediately after an occlusion, although maximum development of the system probably requires days or weeks (1). In cases of MCA occlusion, especially in acute cases, a risk of severe infarction exists because of the large extent of irrigation. When the proximal segment of the MCA is occluded, the MCA territory is primarily supplied by the LMA from the ACA or PCA or both (1, 3–6). It can be expected that three to five LMAs are present between the MCA and PCA (7). Among them are the anastomoses between the angular or posterior temporal arteries of the MCA, and the parieto-occipital artery is the largest and main route to supply blood to the MCA territory via the angular and posterior temporal arteries in cases of M1-segment occlusion (3). Assessment of collateral flow from the PCA via the LMA is clinically important, because it plays an important role in the development and extent of infarctions. It is not clear, however, how collateral flow via the LMA affects prognosis. Derdeyn et al (5) reported that leptomeningeal collateralization is not a specific sign of increased oxygen extraction fraction, and a few studies have revealed that small-vessel collaterals such as the LMA and extracranial-intracranial pathways provide decreased cerebrovascular reactivity (8–10). Investigators of these studies postulate that collateral flow via the LMA represents increased cerebral blood volume. In fact, infarct size in 11 patients who had prominent collateral flow from the PCA via the LMA was small and limited to the basal ganglia or insular cortex or both, and prominent collateral flow from the ipsilateral ACA was also present. We found a strong correlation between PCA laterality at MRA and the existence and degree of collateral flow via the LMA to the ipsilateral MCA territory. Furthermore, nine patients with only the ipsilateral P4 segment observable at MRA had prominent collateral flow. We call this finding the “ipsilateral P4 sign” and aver it is a reliable finding to predict the prominent collateral flow from the PCA via the LMA (Fig 1). However, the low negative predictive value of PCA laterality at MRA for the existence of collateral flow indicates that, if laterality is negative, we cannot conclude that collateral flow is totally absent, although collateral flow tends to be mild in cases of false-negative PCA laterality. On the other hand, the observable PCA laterality was significantly less common among control subjects, which supports the contention that the laterality represents a unique finding in cases of unilateral MCA occlusion. However, other sources of PCA asymmetry may exist, such as contralateral atherosclerotic disease, which could confound the interpretation of this finding. Ipsilateral P4 sign in a 73-year-old female patient who presented with acute-onset right hemiplegia. A, 3D TOF MRA obtained 3 hours after onset showed left M1 occlusion. Ipsilateral P4 (parieto-occipital artery) is observable over almost half of the segment (white arrows). B, Anteroposterior view of left vertebral arteriogram shows prominent collateral flow from the PCA to the ipsilateral MCA during the capillary phase (black arrows). In our study, five of 25 patients had ipsilateral, fetal-type PCAs; in two of these cases, PCA laterality was a false-negative finding. The high incidence of fetal-type PCA in the general population requires a discussion about its implications. In our control group, 28 subjects had a unilateral, fetal-type PCA. Observable laterality was noted only in three subjects of 28 in the fetal-type group. The origin of the PCA and the slight difference of the distance from the entrance of the slab have little influence on visualization at MRA. A positive finding of PCA laterality remains predictive of collateral flow in the setting of fetal-type PCA. Magnetization transfer contrast, tilted optimized nonsaturated excitation, and zero-fill interpolation were used in our study to obtain enhanced contrast and homogeneous signal intensity on 3D TOF MRA images. The distal extent of signal may partly depend on the MR system, parameters, and background signals used. Nonetheless, the “laterality” of PCA signal should occur regardless of equipment or technique used. Mandai et al (11) reported that acetazolamide improved visualization of peripheral intracranial arteries at 3D TOF MRA and postulated that the improved visualization might be achieved by rapid increase of cerebral blood flow induced by vasodilation. In cases of prominent collateral flow via the LMA, if the PCA branches are supplying their own territory as well that of the MCA, bulk flow of blood in these vessels will be increased by vasodilation. This increase in bulk flow, which yields more fresh and unsaturated protons rather than the flow velocity, is likely the reason for improved visualization. Prominent PCA laterality at 3D TOF MRA in patients with ipsilateral MCA occlusion represents the existence of collateral flow from the PCA to the ipsilateral MCA territory via the LMA, and the ipsilateral P4 sign may be useful in routine study to suggest prominent collateral flow. Accepted after revision July 8, 2003. Letter by Gomez-Choco and Valdueza Regarding Article, "Posterior Cerebral Artery Laterality on Magnetic Resonance Angiography Predicts Functional Outcome"